How much damage will Harvey cause? Hurricane Harvey has dumped about 2 feet of rain along Texas' Gulf Coast, an amount that could double in some places before the storm is done battering the region. And when the waters finally recede, the extent of the damage will be revealed -- from soggy and broken keepsakes to waterlogged cars and wrecked homes and businesses. The total destruction that Harvey will bring is far from clear. AIR Worldwide, a risk modeling company, estimated Monday that insured losses from just the winds and storm surge could reach more than $2.3 billion. And an earlier estimate from the analytics firm CoreLogic showed that Harvey, which is now a tropical storm, could cause as much as $40 billion total in damage. 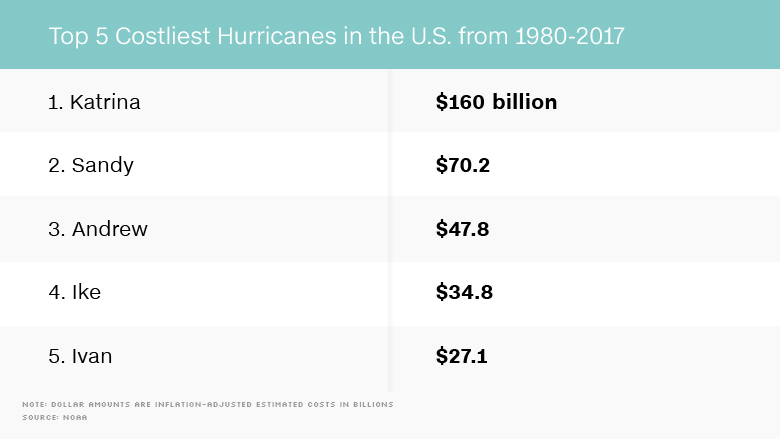 That's enough to make it one of the costliest hurricanes to ever hit the United States -- and many people will not have adequate insurance to rebuild. One of the key reasons the cost of the storm damage is difficult to predict: Experts are still waiting to see what kind of flood damage Harvey wreaks, said Pete Dailey, a vice president at the catastrophe modeling company RMS. Houston could see 50 inches of rain by the weekend, forecasters predict. "This is a very special circumstance given the amount of rain," Dailey said. "Just the sheer volume of rain that's falling from the storm that's been exacerbated by the storm's slow trek over the Gulf and its slow meandering track over Texas." 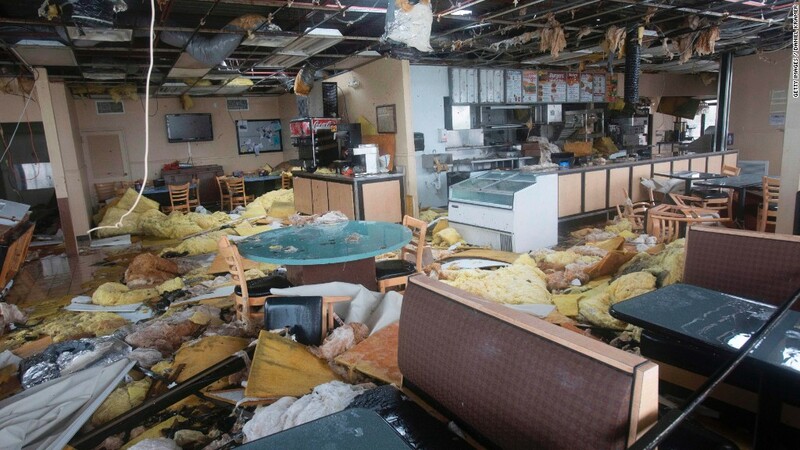 Usually, severe winds that tear off roofs and uproot trees are a major source of damage during hurricanes. But in Harvey's case, storm surge damage brought by the storm's winds likely won't be as extensive as inland flood damage from rivers that overflow their banks, Dailey said. Meantime, pooling water from rain in urban areas can damage homes, offices and other buildings. Ocean water can be an even bigger headache than freshwater rains since the salt in it can corrode and destroy electronics, wiring and building infrastructure. The rains and floods from Harvey will almost certainly magnify the impact of the storm, said Chuck Watson of Enki Research, a disaster modeling group. Ordinarily, Watson said a hurricane like Harvey might cause less than $5 billion in economic damage. But the floods could cause that number to balloon, and additional factors could make Harvey a $30 billion storm. He compared the rainfall from Harvey to that of Tropical Storm Allison, a 2001 disaster in the same region that caused about $12 billion in damage. "Harvey has put more rain in the Houston area in less than three days than Tropical Storm Allison did in five days," Watson said. There are plenty of other factors to consider, including damage to transportation and electrical power and the storm's effects on the workforce and the region's energy sector -- a vital one for the country. Analysis from RMS shows that roughly 10% of the drilling rigs, oil and gas platforms, wells and other energy assets in the Gulf of Mexico could be affected by Harvey. That equipment is valued at more than $20 billion. Another issue: Watson estimated that less than a third of the damage that Harvey might bring will be insured. The Consumer Federation of America on Monday estimated that Harvey could result in as many as 50,000 claims for wind damage by homeowners, with payments likely approaching $2 billion. Insured flood claims could be more than $5 billion, the company said. — Have you been affected by Hurricane Harvey? Do you plan on filing an insurance claim — or are you unable to? CNNMoney wants to hear from you. Email the author of this article at jill.disis@cnn.com.